I received my yogurt maker and have used it once to date. The yogurt did not become firm in two of the eight containers. What might cause this? 1. Temperature: The outer jars are cooler and take a little longer to set. This is especially true if the room is cool. 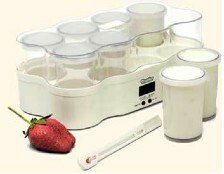 Halfway through the yogurt heating cycle, you could rotate the inner jars to the outer positions, and the outer jars to the inner positions. 2. Uneven distribution of the starter culture in the milk: Use a wire whisk to mix the starter culture in a small amount of milk to make sure it is dissolved and evenly distributed in the milk. Do not use a spoon. A spoon requires more mixing, dissolves less culture, and causes the yogurt to become stringy. When the culture is mixed into the small amount of milk, pour that milk into the remainder of the milk and stir briefly with the wire whisk. 3. Weak starter culture: Unlikely in your case, since it is relatively new. Store starter culture in the refrigerator to increase its shelf life. I hope you enjoy your yogurt maker as much as we do!